Many homeowners share this anxiety over choosing a roofer. This can be attributed to the fact that homeowners and business owners don’t really understand how roofing systems work. Therefore, if you are looking for a roofing contractor in Houston, Texas and fit the description, you probably don’t know the right questions to ask. Also, you can’t be telling if a roofing contractor is not being truthful. You can start by investing some time in exploring and educating yourself about roofs. This is a must-do before you contact a roof repair Houston Company. This may seem like a boring task. However, it is absolutely necessary that you understand the system so that you can ask valid questions when you interview different roofing contractors. As a matter of fact, you can really save lots of time if you pre-select the roofing material you intend to use. Does the company possess an up-to-date roofing contractors Houston license? A reliable roof repair Houston contractor will have a professional license for the city in which they do business. Remember to check if they possess a licensed by the State of Texas as a roofing contractor. Proper licensure and good standing with The Roofing Contractors Association of Texas (RCAT) indicates an acceptable, consistent level of quality on the job. Several Houston Roofing Companies work out of a truck, without any office or central location, making it rather easy for them to vanish without a trace. If you face any trouble during a job, there wouldn’t be any office to call or place to go in order to find them. Therefore, the wisest thing to do is to keep such roofing contractors at bay. Hire expert roofing companies in Houston Texas with a physical office to avoid such events. It is critical that you don’t make any decision based purely on price. While it’s imperative to weigh competing quotes against each other, your decision must ultimately be based on the quality of craftsmanship the roofing contractor can deliver. Will there be further subcontracting of work? Check with the roofing contractors whether they have the bandwidth to complete all the work themselves. Take details on the subcontracting the work, if they are planning to do so. It is important that you are aware of who is going to work on your property. It is also crucial that you obtain all of the previously mentioned insurance information from each of the subcontractor. Also, make sure that the subcontractors are receiving the money too so that they don’t suddenly stop working due to non-payment. However, you can eliminate this obstacle by working for a reputable company that can fully staff the project. Installing a new roof is a major investment. Therefore it is important that you choose to work with a reputed roofing contractor in Houston who can provide quality craftsmanship using genuine materials. 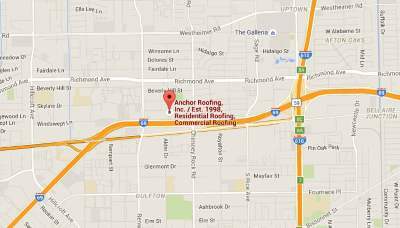 Anchor Roofing is a leading roofing specialist in and around Houston Texas. You can contact us for all your roofing needs.